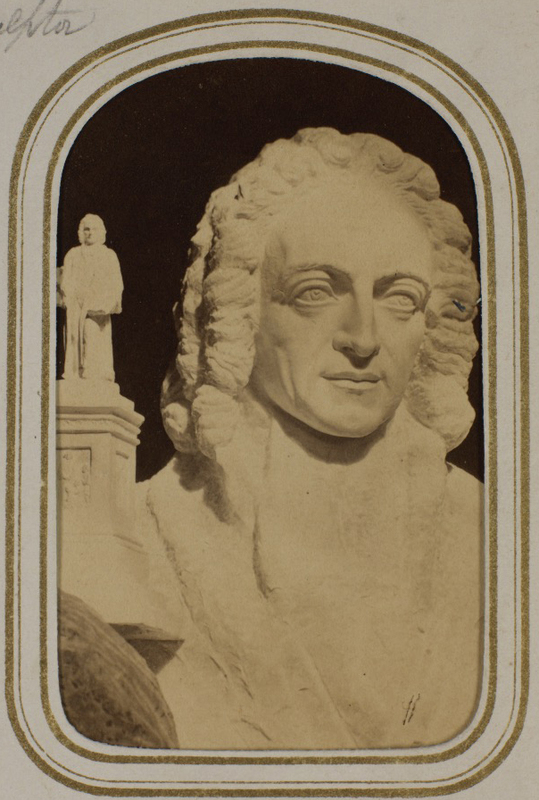 On the 17th July, 1861 – the anniversary of his birth – a crowd gathered in a Southampton park to witness the inauguration of the statue of Isaac Watts, one of the town’s most famous sons. 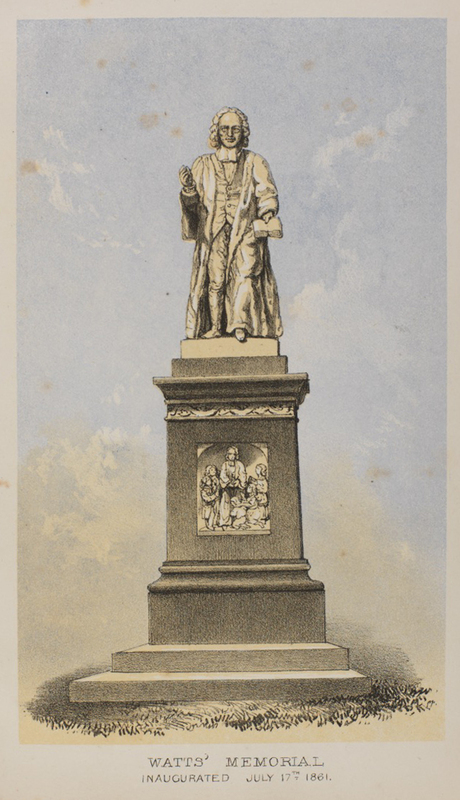 Financed by public subscription, the statue was the work of Richard Cockle Lucas, the eccentric sculptor of Chilworth and depicted Watts facing towards the town in the attitude of a preacher, with basso- relievos on the sides of the pedestal recording his activities as teacher, philosopher and poet. 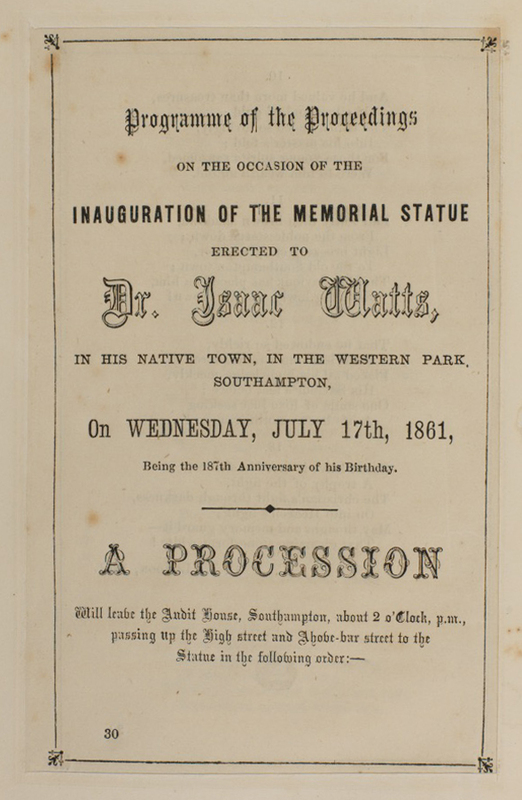 The events of the day are recorded in the Cope Collection’s copy of Memorials, Historical, Descriptive, Poetical & Pictorial, Commemorative of the Inauguration of the Statue to Dr Isaac Watts in the Western Park, Southampton (1861), which also noted that the area around the statue would in future be known as Watts’ Park. A procession which began at 2 o’clock was followed by poetry readings, hymn singing and an inaugural address given by the Earl of Shaftesbury, the proceedings being concluded by a soirée at the Royal Victoria Rooms at which ‘a large assemblage of persons of all ranks, parties and denominations’ enjoyed refreshments at moderate charges. Born into a nonconformist family in 1674, Isaac Watts was educated at the free grammar school until the age of sixteen when he left Southampton to attend the dissenting academy at Stoke Newington. His life as an Independent minister was greatly influenced by these early years during which his father, also named Isaac, was imprisoned for his beliefs and was, for two years, forced to live away from the family. 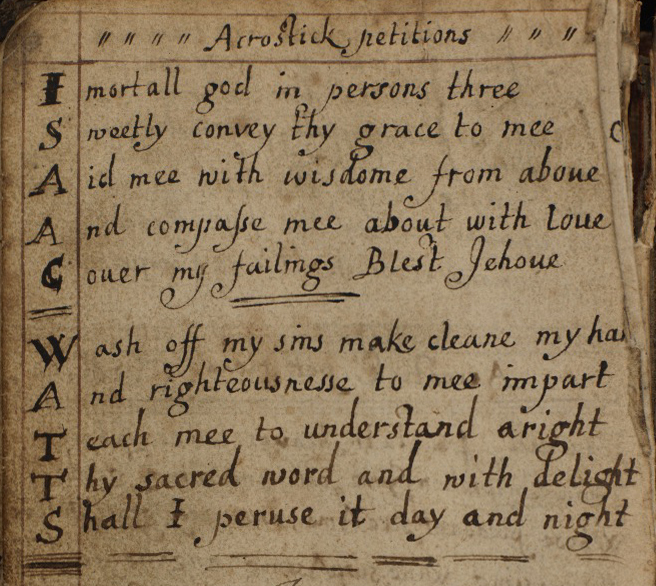 Two Bibles which belonged to the Watts family at this time are now in the University Archives, the family Bible which belonged to Isaac Watts senior which records his marriage to Sarah Taunton and the birth of their children, and a smaller pocket Bible, passed from father to son, in which the younger Isaac added his own contemplations and acrostic petitions. Southampton also played a part in Isaac Watts’ career as a hymn-writer. It was on a lengthy visit after he had finished his education, that he began composing many of the hymns for which he became famous. The story was told that after accompanying his father to a service at the Above Bar Independent Church, he complained about the quality of the hymns (the texts, not necessarily the singing) and was told to mend the matter himself. This he did and in 1707 published his Hymns and Spiritual Songs. In 1719 The Psalms of David Imitated in the Language of the New Testament followed, in which Watts interpreted the Psalms in a way which reflected Christian worship. The town has also been suggested as the inspiration for some of the lines in Watts’ hymns, particularly those in ‘There is a land of pure delight’. Today the links between Isaac Watts and Southampton are clear to both see and hear as the tune ‘St Anne’, commonly used for one of his best known hymns, ‘Oh God our help in ages past’ (a paraphrase of Psalm 90), rings out from the Civic Centre clock tower overlooking Watts’ Statue in the centre of Watts’ Park. This entry was posted in Printed Collections and tagged Bibles, Hymns, Isaac Watts, Psalms, Richard Cockle Lucas, Southampton, Statues. Bookmark the permalink.